Designed to deliver maximum capabilities, flexibility and accuracy optimized with extended measuring, documentation and statistical functions. Thank you for your interest in the HT-250. Please fill out the form below so we can send you the brochure. Thank you for your interest in the HT-250. Your request has been submitted to our sales department, and we will get back to you soon. Simultaneous testing of integrated motor generators and variable frequency motor drives up to 25 kW or 90 Nm. Reduced R&D cost by testing two components with only one machine. Measures Motoring – Generating: Active & Apparent Power, Power Factor, Efficiency, Torque, Resolver Angle, Back EMF, EMF Constant, Amplitude Imbalance, DUT Temperature and optional Sound and Vibration. Automated endurance test with programmable scripting of test procedures. Precise Performance via High Resolution data acquisition system. Phase imbalance measurement technique able to detect and display phase imbalance conditions. Expanded report statistical capabilities. User programmable report generator sends results to MS Excel ® for performance report print out. Previous test can be retrieved for display. Expandable measuring interface for custom requirements. Temperature inputs and auxiliary analog channels available for customer defined measurements. 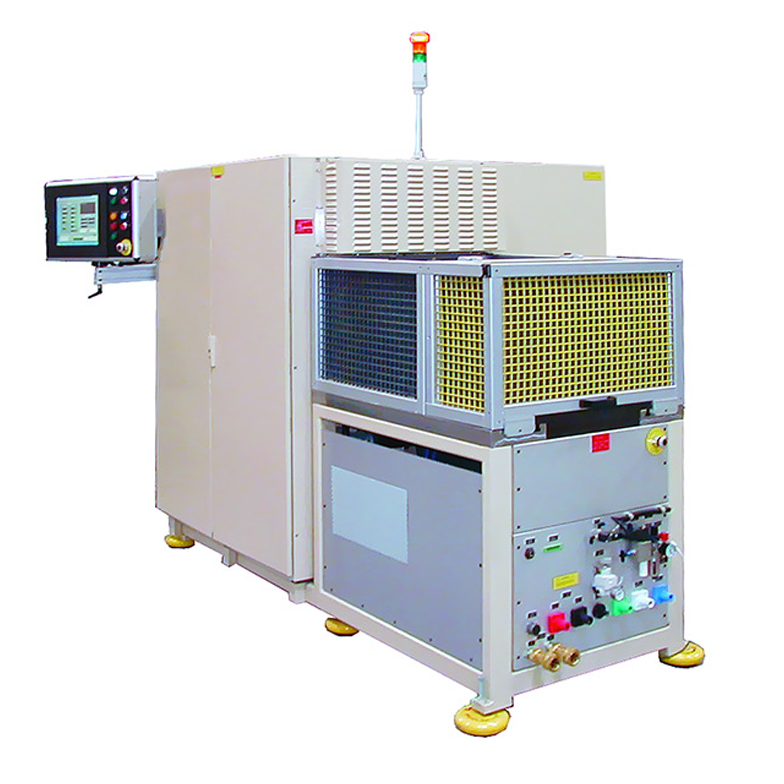 Water based coolant input – output or optional Oil circulation unit with constant flow and temperature. Scalable measuring system can be configured with optional components for testing larger capacity devices.